What change took place in less than 24 hours that compelled New Delhi to withdraw from the talks? Does the Indian government have a coherent policy towards Pakistan? Is ‘adhocism’ now the mantra followed by India’s foreign policy? After the abrupt cancellation of talks between the foreign ministers of India and Pakistan by New Delhi, the aforementioned questions – which were only whispered earlier – are now being raised loud and clear. India has not been taken for such a ride by its own government before, the way it is under the Narendra Modi regime. Never before has a party with such an overwhelming majority treated its own people so shabbily. What the Bharatiya Janata Party (BJP) government has been doing for the last four years is purely an abuse of the hope and expectations of the people who voted the party into power. In May 2014, when Modi invited South Asian leaders to his oath-taking ceremony, including the Prime Minister of Pakistan, he ignited a new hope of change in the subcontinent. His gesture was construed as a valiant move to break free from the established narrative that has guided India and Pakistan’s turbulent relationship over the last 70 years. Modi’s arrival and his gesture thus offered hope of a new vision. But what the world thought to be a new beginning was in fact nothing but showmanship. The talks that were meant to be held between the foreign secretaries, scheduled to take place within weeks of Modi’s swearing-in, were cancelled at the last moment. The reason for this pinned the blame on Pakistan, for the Pakistani ambassador in Delhi met some separatist Kashmiri leaders. Pakistan, however, has had a history of engaging with Hurriyat leadership, and no previous governments in Delhi raised any objections to it. In 2015, Modi dropped by Lahore for some tea, and in another goodwill gesture allowed a Pakistani delegation to visit Pathankot, the Indian Air Force base in Punjab, to investigate the terror attack that took place there. This step forward was also followed by multiple steps back. After more than a year of impasse, a new hope was resurrected when Imran Khan was elected into power, for his conciliatory attitude and desire for peace was reciprocated by Modi initially. A lot was made out of how Imran’s election would impact ties between the two states, as he even went out of his way and wrote a letter agreeing to discuss terrorism, and the future seemed hopeful when India announced talks between the foreign ministers of both countries at the sidelines of the United Nations General Assembly (UNGA). However, after confirming the talks, India backtracked and cancelled within 24 hours. One has to wonder, what change took place in less than 24 hours that compelled New Delhi to withdraw from the talks? Officially, India cited the killing of policemen by rebels in Kashmir as the reason for the termination of talks. Another reason provided was the release of a stamp by the Pakistani government commemorating Burhan Wani. However, an objective reading of the situation will tell you that these two realities were already present when New Delhi agreed to meet the foreign minister of Pakistan in New York in the first place. Not only that, the escalated violence at the border has been a reality since 2014. Never before have so many Indian soldiers (4,000 since Kargil, if one believes various Indian news reports) lost their lives in such a small time period. Blaming Pakistan for the deteriorating situation in Kashmir is like shutting your eyes to hide what is right in front of you. It cannot be denied that Pakistan has a role to play and its own interests to follow in Kashmir, but India is only aggravating the situation with its high-handedness. If today a youngster in the valley picks up guns or if a mother asks her son to sacrifice his life rather than surrender to the police, the onus lies on the Modi regime, which is responsible for killing future generations of Kashmir. For its own failure in Kashmir, New Delhi does not want to talk to Pakistan. What kind of policy is this? The strength of a ruler is revealed by the guts he or she demonstrates in the face of adversity. Modi likes the world to believe he is a man of action and can make tough decisions. But when did fickle mindedness become a sign of strength? In reality, Modi is scared to face a highly-charged electorate and has thus made a hasty retreat from the offer of talks in the face of a coming election. But instead of answering anything, this only raises more questions: what is Modi’s Pakistan policy? And how does he want to deal with Kashmir? 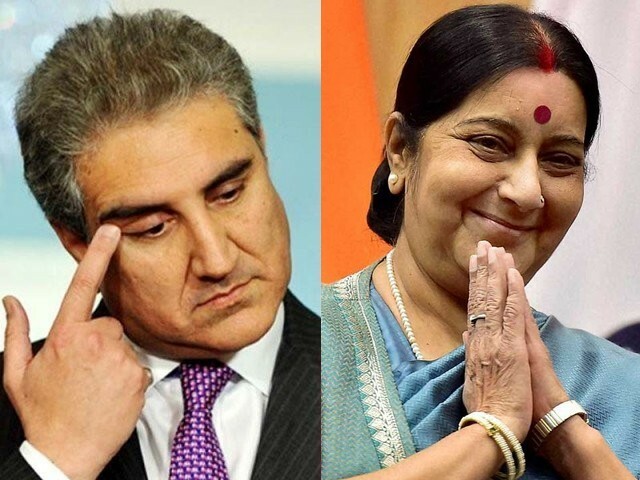 So India does a rethink of the jnformal meeting between @SushmaSwaraj & @SMQureshiPTI after first saying Yes, Now No. The horrific killing of three Kashmir policemen has been trigger. But the confusion in the government's Pakistan policy persists. Still very-Yes, No & Maybe. If the actions of this government have led to the economic stagnation in India, it is also to be blamed for the dissipating moral and intellectual capital of the country in the last four years. The government continues to believe that by indulging in jingoism, supported by a section of the pliant media, it can claim it has answered the questions rightly posed by the public. But how can the government hide its own criminality and gross abuse of human rights in Kashmir by cancelling talks and subsequently blaming Pakistan? What can evenly be concluded is that Modi is afraid of peace. Why else would a leader who claims to have the backing of the new India not want to invest in peace? A stable South Asia, with better relations and greater trade, is in the larger interests of both India and Pakistan. There is no harm in giving peace talks a try, but Modi has thus far only demonstrated a mindset which is prisoner to the past and aiming towards a future that is destructive for the entire region. about every country, except, Bhutan and Nepal. with ripping out, brick by brick and destroying Babri Mosque in Ayodha. virulent toxic Hindu extremists outfit. Modi Sarker is a champion at Muslim hate mongering. all depends on good relations with nuclear armed Pakistan. Which means ‘talks’. Afford? Meaning buying with Hindustani ruppiyas? How is that? So sorry, Hindu currency as they say “aint worth much” on the market. So all those obsolete weapon systems are first generation hand me downs from Russia. From the European scrap markets. Modi Sarkar did buy some Rafale jets, and the Hindu Congress is after him now. In 1948 we got half of Kashmir. In 1965 the war ended in a ceasefire with the aerial front being dominated by the PAF. We managed to hold at bay a country 6 times bigger than us. In 1971 India being the opportunist cowardly nation it is took advantage of Pakistans internal civil war and declared war on the eastern front and that’s the reality of it. It knew it would face the same fate if it went to war on the western front like in 1965.